This walk: 2011-7-20. Anthony Stile, Rowtor, West Mill Tor, Yes Tor. Anthony Stile is something of a mystery name - there is a gate nearby but no stile, and no-one has ever explained who Anthony was. "X marks the spot" - A feature of unknown military function, even to the military. There are four "stays" or anchoring points for a flag pole? An old imitation trench dug in the Boer-style for training attacks during the Boer Wars, 1880-1881 & 1899-1902. A picturesque clump of gorse. Rowtor, SX 593 916, elevation 468 metres (1535 feet). Branscombe's Loaf, on Corn Ridge. Yes Tor, SX 580 902, elevation 619 metres (2030 feet). West Mill Tor, SX 587 909, elevation 541 metres (1774 feet). Zoomed view: these sheep are from the “famous” orange flock which were in the news a while back - they were dipped orange to deter sheep rustlers and to aid spotting on the moors. The appearance of their tails being particularly white may be because they have been "dagged" - and I'm not explaining it! War Department (now MOD) field telephone system ................. "Hello, Intelligence here". West Mill Tor, looking north. The hardy Moor Strollers present on this walk. Heading back to the car park. An isolated tree - believed to be a Hawthorn. The cars are there somewhere: looking at Okehampton Camp from the south. 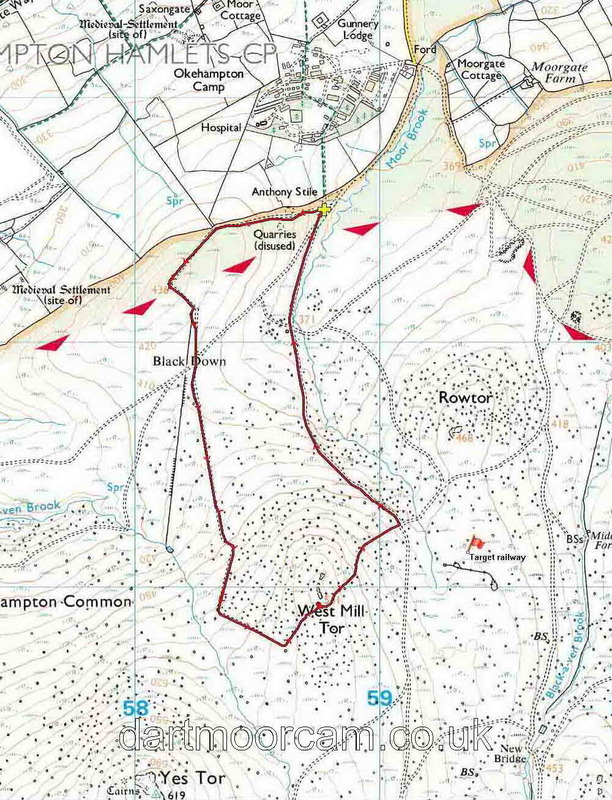 This walk was reached driving on to the moor from Station Road, Okehampton, and turning RIGHT after crossing the cattle grid by the guard house (by the Moor Brook "Ford" on the map) seen going onto the open moor down the road from the military camp, parking at the yellow cross on the map.